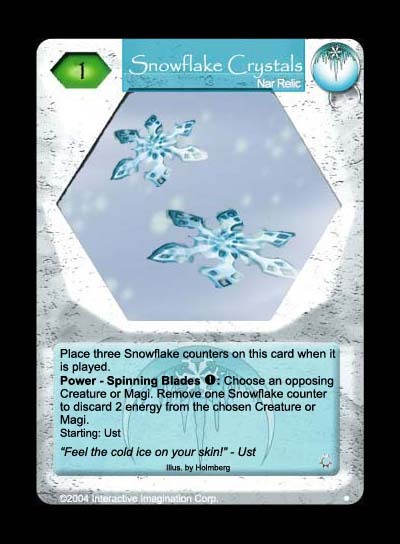 Counters make an interesting comeback in Elder's Legacy and Snowflake Crystal is one of the cards with them. This card isn't meant for a Nar frozen deck, but would fit well in Nar's other two major decktypes - creatureless and relics. Unlike most counter relics, this one stays aroudn after the counters are used up, so that it can be used to draw a card if one has Void Stone in play. The image is from the Ust calendar image of December 2002, which has been photoshopped to produce the final result.